We were in St Kitts on September 3rd. Our shore excursion for the day was to take a double-decker train ride around the island. The train's lower level was enclosed and air-conditioned... but we sat ourselves upstairs with the open canapy and the lovely island breeze (and the pina colodas and the rum punches). 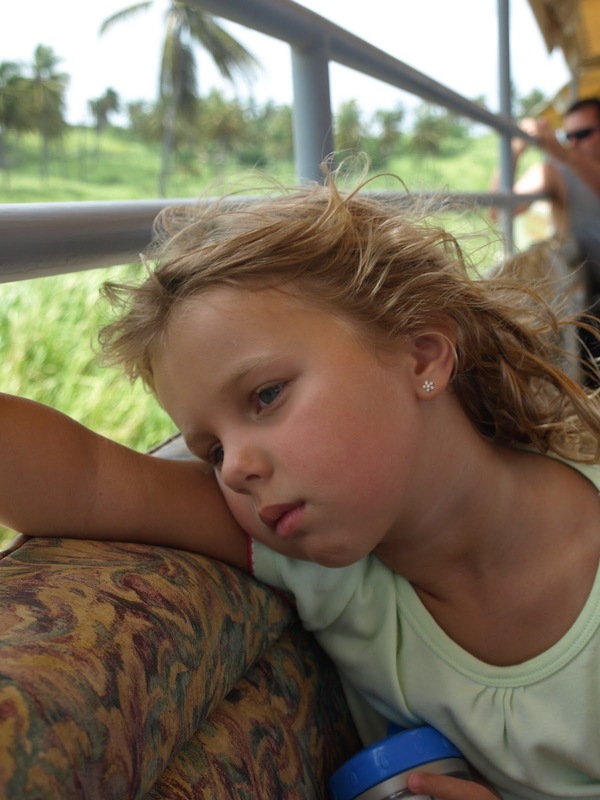 Ana did not love the train ride. This is what Nick looked like to me for a lot of the cruise. St Kitts is covered with green fields and mountains. Oh, and palm trees. Lovely palm trees blowing in the tropical breeze. Zoe took a moment to sit back, rest, and enjoy rocking of the train. There was just so much open space. So many glimpses of beauty. We guess the people of St Kitts don't need lawn mowers... they have goats to do the job. It was almost unbelievable that for most of the 2 hour (18 mile) train ride this is mostly what we saw. Green fields. Blue ocean. This photo makes me laugh... because I KNOW what happened right after I took it. That tree branch (not the first or last one) smacked along the train, made noise, and lost leaves... lots of flying random leaves. A split second later Ana SCREAMED like the tree was trying to kill her. Then... her Mommy laughed. She has a rotten Mommy who laughed at the fact that even after it happened a dozen times... Ana screamed every time. Look how calm and serene she looks. See how Nick's face has realized what is about to happen? Pour Ana. Rotten Mommy. We saw dozens of these chimneys as we rode around St Kitts. They sit on sugar cane plantations that are no longer working plantations. They have tons of sugar cane growing... but no longer export sugar. So many wild growing fields. My mom mentioned a few times that she really had no idea that the Caribbean islands were so mountainous. It was just so beautiful. When we finished our train tour we headed back to the port and walked through some of the shops. Zoe was very excited that this man let her (for $5) hold his baby monkeys and get her picture taken. They were ADORABLE. 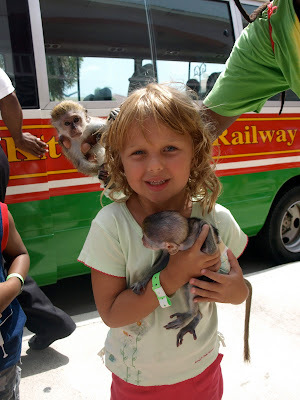 I think she would have been really happy if we let her bring a monkey home.